2) Participators should summit the original works. Any slide, photograph or xerox will not be accepted. 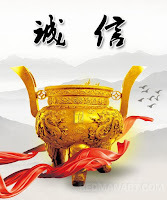 CG\Digital works be accepted,E-mail to: redmanart@126.com and mail to the organizing committee. 3) The maximum 10 entries should be submitted for each category. 4) The maximum size of the works should be 200 ×200cm respectively. 5) The works should be accompanied by the author's resume and photo (or caricature). 7) Technique and medium of works are unlimited. 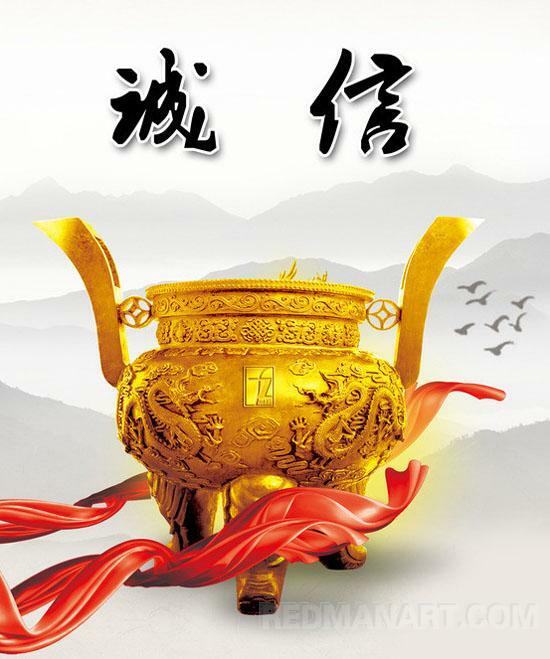 Any painting, Print making, Traditional Chinese Painting, Oil painting, Watercolor, Crafts art or sculpture will be accepted. The deadline for entry is the 31 of January, 2016. 1) The entries must be flat protected with hard cardboard, or rolled in a hard case. The folded works will not be accepted. 1) The jury committee is composed of artists, printmaking artists, cartoonist, illustrators and press editors. 2) The jury meeting will be held on April, 2016. 3) The committee will announce the result on June, 2016 on web site. At the same time organizer will contact the winning artists via postal mail or email. Entry form on source: http://www.redmanart.com/en/bencandy.php?fid=6&id=600 . 3. Each entrant should provide title, name, age, address, career, e-mail, and telephone number on reverse. 4. Entries can be either black and white or colour. 5. 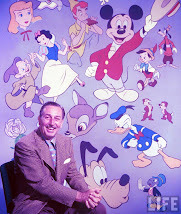 Size of cartoons should not exceed 500 x 500 mm. 6. The number is not restricted. 7. Deadline for entries is September 15, 2015. 8. ANIMATION SHORT FILMS: within 1 minute - 20 minutes in AVI，MPEG，WMV，AFS or MOV. The minimum of with a resolution ratio of 720×576, and the film name and main staff list notified in the main title. 11. The results release date: November . 12. 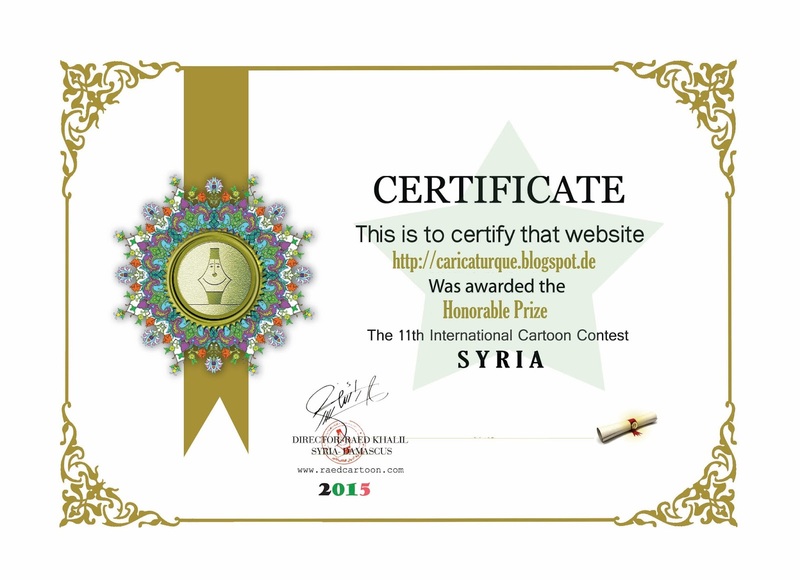 The organizers reserve the right to publish the cartoons submitted to the festival and use them in any forms. Your cartoon may be used for promotional purposes : cards, posters, catalogs, newspapers, magazine, and books etc. International competition and exhibition "Brain Sneezing - from kalokagathia to hypochondria and back" is financially supported by the Government Office of the Slovak Republic and Embassy of the Unitet States of America in Slovakia. Community of common destiny for all is a concept proposed by President Xi Jinping that emphasizes that a country should take into consideration other countries' concerns while seeking its own interests and should promote the common development of all. The concept stems from the idea that we are all descendants of the same ancestors. Although countries have different or even contradictory national interests, religious beliefs, ideologies and social systems, we all live in and share the same world and should try our best to coexist peacefully. Please focus on the theme. Key words for the theme include peace, harmony, sustainable development, cooperation, environmental protection, public welfare, Earth, anti-war and anti-monopoly. 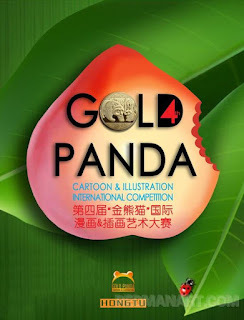 Professional and amateur cartoonists from China and overseas are welcome to enter. Note- the deadline includes time taken to receive work so participants are urged to submit entries as early as possible. 1) There are no limitations on the styles of submissions or the number of each participant's submissions. 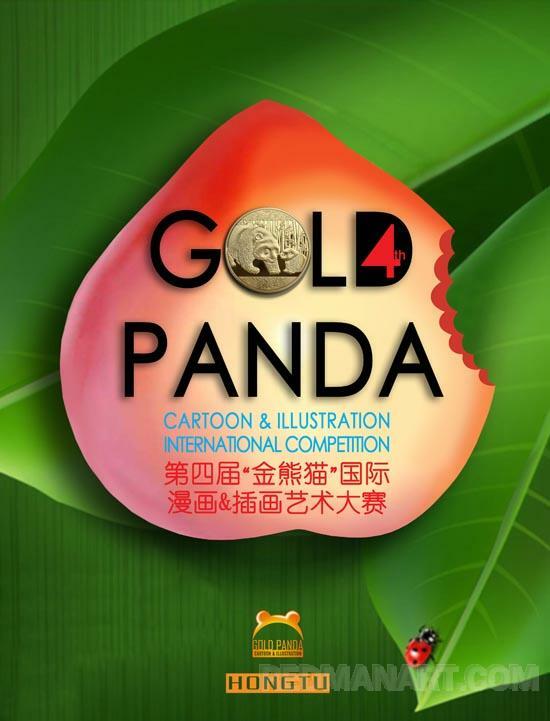 Participants can download an entry form at www.newscartoon.com.cn. Please download the form and fill it out as accurately and truthfully as possible. Photocopies are acceptable. 1) The organizers reserve the right to refuse entries they consider legally, morally, politically or religiously offensive, as well as work that is considered in violation of acknowledged moral standards. 2) If a contribution has any intellectual property rights or copyright disputes, the organizer holds the right to revoke the participant's eligibility to participate in the competition. Participants are solely liable for any consequences that may arise from submitting work to the competition. Participants must be the owner of all rights of the work submitted and it is the responsibility of the participant to ensure that his or her contributions to the competition do not generate any copyright or other intellectual property rights disputes. 3) The organizers reserve the right to use the contributions for presentation and media use. 4) Organizers and participants share the copyright of the contributions. Organizers of the event have the right to display and distribute contestants' works. 5) By submitting a contribution to the competition, the participant agrees to accept all of the rules. Registration: from August 15th to September 15th, 2015 (EXTENDED:) 20 SEPTEMBER 2015. Selection: September 17th and 18th, 2015. Official grand opening: October 1st, 2015 at 11 o´clock. Award date: October 3rd, at 20o´clock. Location: at the Veredas Hotel convention center. End of the event: October 12th, 2015. 2.1 Can enroll in the event all artists, professionals or amateurs, and students from junior and high school who are over the age of 16. 2.2 Each author can enroll up to three artworks per category. The enrolled artworks must be unpublished and about the indicated theme. 2.3 Artists from any country can enroll in the competition. 2.4 Enployees or their relatives connected to the organization of the event are not allowed to participate. 3.1 Description: AGUAI (WATER) – verb, to pour water on to plants or the soil that they are growing in. It is allusive to the rational use of water. Generally, the uses of water are part of the human activities. In this sense, the water can be used for consumption or as an input in a productive process. The spelling is also allusive to the Brazilian state of Minas Gerais, where the inhabitants are used to say Uai – Água (water) +Uai=Aguai (to water). 3.2 The artworks from all the categories must be sent electronically (registration on line, JPEG Format/300 DPI). 3.3 Free style technique. Digital copies signed by the author and numbered (e.g. : 1/1, in case of one drawing; 1/2 in case of two, and so on). Maximum size allowed: 42x30cm (A3). 3.4 Each artist can enroll a maximum of 3 (three) artworks in each category, which are CARTOON, CARICATURE and EDITORIAL CARTOON. 3.5 With the artworks enrolled the artist must attach the application form properly filled in a legible handwriting and signed. It is also required a short curriculum and a photo for our database. 5.2 The awards will not be shared. The chairman of the judging panel will decide who will be the winner, in case of a tie. 5.4 There will be a pre-selection committee and another one for selection and award, composed of capable people in the subject. 5.7 Other prizes and mentions can be institute by the committee as they see fit. 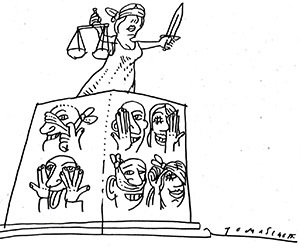 6.3 Omission cases must be presented and will be evaluated by the Event´s Organaizing Committee. Non-profit organisation SINA Nitra n.o. Topic: drawn humor about people, whose sight is completely or partially missing and about sight in general. Target: By humor, we want to remind people about how important sight is in human life and what barriers must be broke by the people whose sight is missing. Note: Don’t be worried about this topic. You’ll find examples on how access it on the web that is mentioned below. 1. The competition is declared in two age categories. B category – authors to 18 years. 2. Every author can participate in the competition with minimum two former works in original, including graphic techniques. 3. The competition is open for everyone. The way of creative processing is not limited. 4. The format of the works is free, A4 is recommended but it cannot exceed A3 format. 5. The competition is not anonymous. Every contribution must be tagged by a name, complete address, birth date and contact info of the author on the back side. 6. Rewarded works become property of the organisator. Other works can be returned by the autor’s request. 7. All sent works can be used for propagational purposes of the competition and for forfilling the organisator’s mission – helping people with sight problems. 8. The selected works will be processed to a relief form for accessing the work by touch with the description in Braill’s font and enlarged font. 9. By attending the competition, the author agrees with it’s terms. 11. The organisator will notify the author electronically (or in written form in case of the E-mail adress’s absence) about the deliverance of his works and their insertion into the competition. 13. In case of other subject’s interest, other expositions can be organised. 14. The Jury of the competition reserves it’s right not to grant one of the prizes or grant other special prizes. On the website (www.hovoriaciweb.sk), the organisator will publish the number of competing people until 30.11.2015, the structure of the jury, the results of the competition and names of the winners. 15. A catalogue and a calendar for the year 2016 will be sent to the selected authors. The calendar will be made from selected works by the organisator. This project has been financially supported by the Ministry of culture of the Slovak Republic. 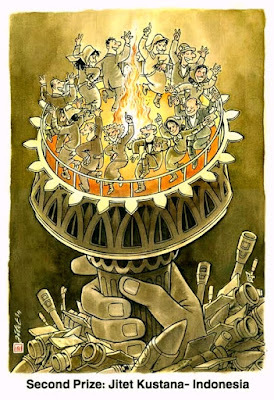 Syria International Gallery of Caricature 2015.
the big and important title “The victory”. 5 - Naji Benaji / Morocco. 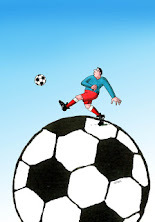 All prize-winning cartoons on raedcartoon. 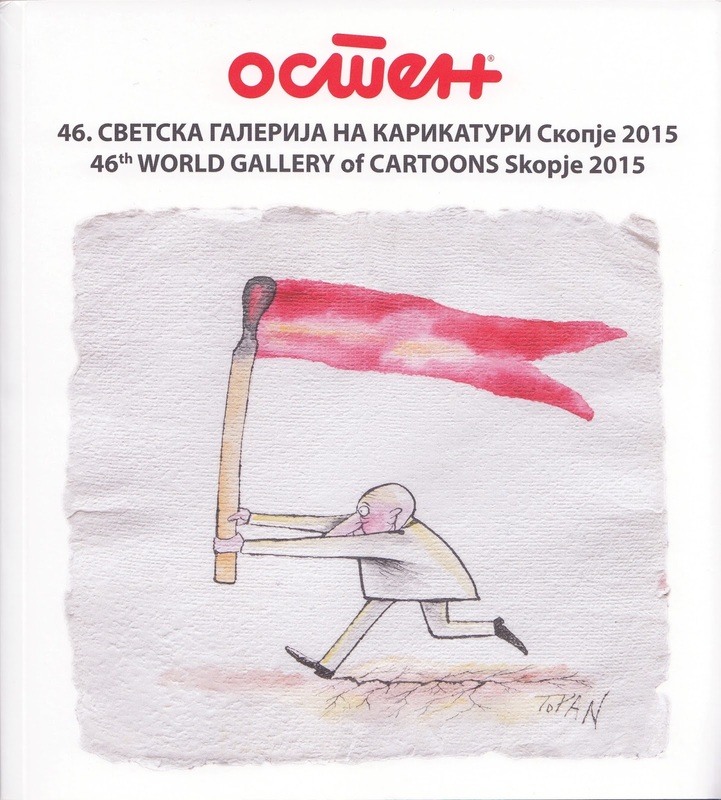 Received today the new catalog OSTEN 46th World Gallery of Cartoons, Skopje 2015, Macedonia. 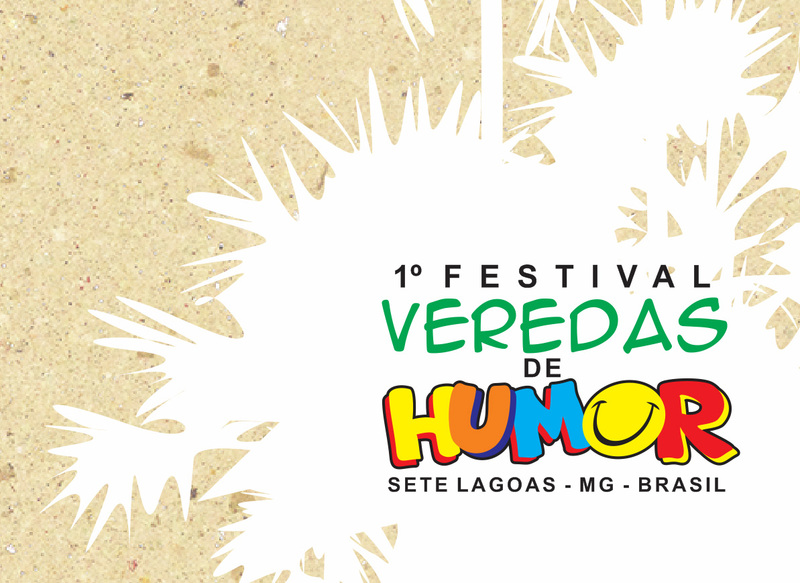 64 pages in color with the size of 20x22 cm cover 120 selected cartoons including the awarded ones. 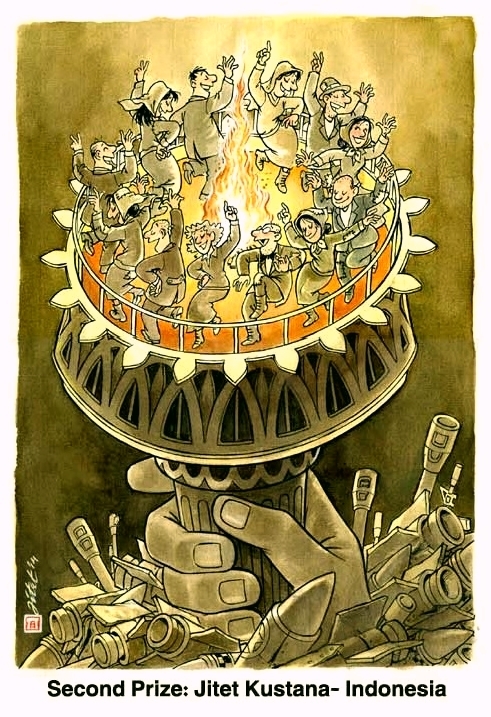 The selectors were the Bulgarian cartoonists Alla & Chavdar Georgievi for this edition and there were also the international jury of course to award the best of the selected. 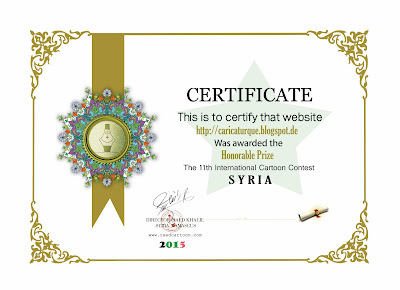 They had received 680 works by 206 cartoonists from 50 countries worldwide. All originals, that is hand drawn cartoons, satiric drawings and comics in any technique on paper. Yet, OSTEN does also pay considerable attention to new trends and organize thematic contests for digital cartoons too, so they can meet the expectation of those artists who are more comfortable with the digital production. The present one is on topic of Beer!!! with the deadline of 20 September 2015. In addition, this year - on the 70-year anniversary of the World Gallery of Cartoons, they will launch an online platform osten4art.com - where all activities of OSTEN art on paper are integrated. The info I quote from the Thank You Note letter, received along with the certificate in the catalog, by Mice Jankulovski, Director of OSTEN. 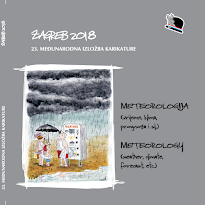 The catalog is also published online where you might read more about the competition and see the prize-winning and the selected pieces of humoristic art here in PDF. More info on website: http://www.osten.com.mk/. 2. Each artist may participate in one or more sections. 3. It is preferred artworks made by classical techniques, but digital artworks will be also accepted. 4. The number of drawings, dimension drawings, technique: at the author's choice. 5. For each section will be awarded four prizes: Grand Prize, First Prize, Second Prize and Third Prize. As well, will be awarded some special prizes. 6. The artworks will be published in the album ROMANIA - A PLANETARY TRIBUTE with the occasion of celebration 100 years of the Romanian national state. 7. The artworks will be sent to the organizers till date of March 1, 2016. It will organize an exhibition and if it will be appropriate will travel to various cities. The drawings selected for awards must be sent by post. 7. Cartoons have to be sent to the following email address: wr@toonsmag.com with Cartoonist’s recent C.V. , address (in doc. format) and a personal photo. For further information please visit www.toonsmag.com.